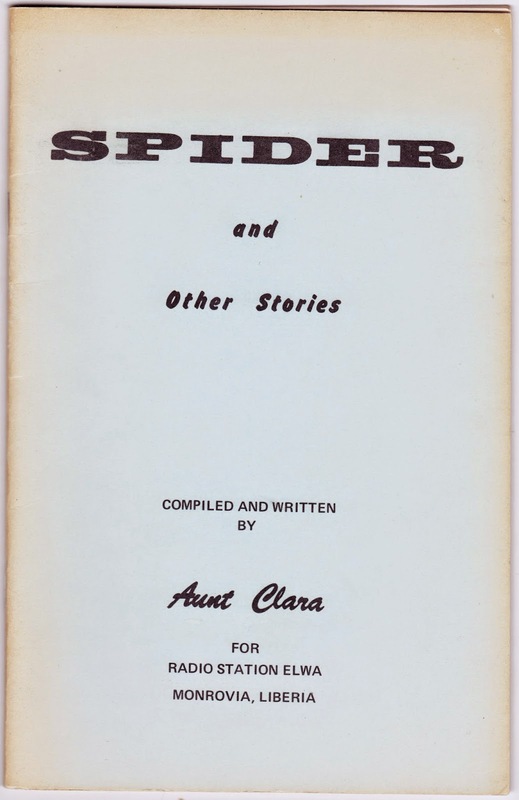 Spider and Other Stories is a 32-page booklet staplebound booklet that was compiled an written by "Aunt Clara" for Radio Station ELWA in Monrovia, Liberia. This is the third printing of the booklet, which was published in September 1972 by the Board of Missions of the Evangelical Congregational Church in Shillington, Pennsylvania. "How Dog Came to Live With Man"
"How Spider Robbed a Goblin & Cheated Death"
"Why Leopard is an Enemy of Deer"
"How Spider Was Beaten, Skinned and Burned"
"How Turtle Drowned Leopard in the Sea"
"How Spider's Son Was Eaten by a Goblin"
You know! Just some enjoyable stories for children, containing Biblically-based truths! And violence and murder! And the eating of children! Here, for your enjoyment, is "How Spider Cooked His Children, And Found Them Bitter" in its entirety, along with my notes and thoughts, in italics. Spider and Hare made some traps and set them in the woods to see what they could catch. Spider set his traps in the river, and Hare set his on land. Spiders catch their food in webs and rabbits are herbivores. Right from the start, we have issues. Spider was hungry before Hare was, and very early next morning he went to his traps. He had caught a few fish. Then he began wondering what Hare had caught, and went to see. In Hare's traps he saw some things which he knew were better to eat than fish; so he took what he found in Hare's traps, and left his own fish there instead. Spider didn't really think things through. How might you have handled this theft differently? Discuss. Later in the morning Hare went off to see if anything good to eat had been caught in his traps during the night. He went close to them and looked. He went even closer and looked more carefully. Finally he looked very carefully; and after a lot of thought he finally came to the conclusion that there were fishes in his traps. He sat down and looked at this fish for a long time, and then said in small voice: "This is curious." He sat there for an even longer time. He tried looking away at the trees, and the sky, and the flowers, and then suddenly looking at the traps again; but each time he did this the fish were still there. It's possible that Hare has disassociated from reality in a serious way at this point, which would explain later events. Finally he said, in a louder voice: "This is very curious, indeed. How did fish get into my traps?" After sitting there for a very long time indeed he said quite loudly: "Spider has been at my traps!" That's not necessarily the only logical conclusion. Then he collected the fish and went home. He cooked the fish, pounded them to a paste, and mixed them with dumboy and palm oil and honey. When he saw Spider coming he told his children to hide, and sat down to eat his meal. Spider came in and sniffed. 1. So Hare didn't ACTUALLY mind the fish. 2. Dumboy is a doughlike food made by boiling and pounding a starchy vegetable. It is more commonly known as fufu. 3. Where did Hare get the honey? Are we to believe Hare is capable of taking on a bee's nest? Or is there a local store? And if that's the case, why did they need to set traps?" "That chop smells wonderful." He tasted a little. "What is it, Hare?" "Ho," said Hare, "I was feeling hungry, so I cooked my children." The proper response by Spider at this point would have been to mask his sheer terror, leave as quickly as possible and notify the authorities. "Well," said Spider thoughtfully, "children are very nice to eat." He ate half of Hare's meal and went home. Also not the proper response. but the food he made was bitter, so he came back to Hare and said: "I cooked my children and ate them, but they aren't as sweet as yours." This is a not community you want to move to. The laugh of a criminally insane psychopath. "Here are my children, still alive," he said, and pointed to them. "Next time you go trapping be content with what you catch." How else might Hare have conveyed this lesson? Do we have a moral obligation not to trick people into killing and eating their own children? Spider went home and cried all night, for he had killed and cooked all his children. Wait until Mrs. Spider finds out. It is never wise to steal from another person's traps. Nor is it wise, probably, to read this story to children right before bedtime. And especially not with a jar of honey sitting prominently on the bedside table. And especially not using THAT voice. That's just wrong. 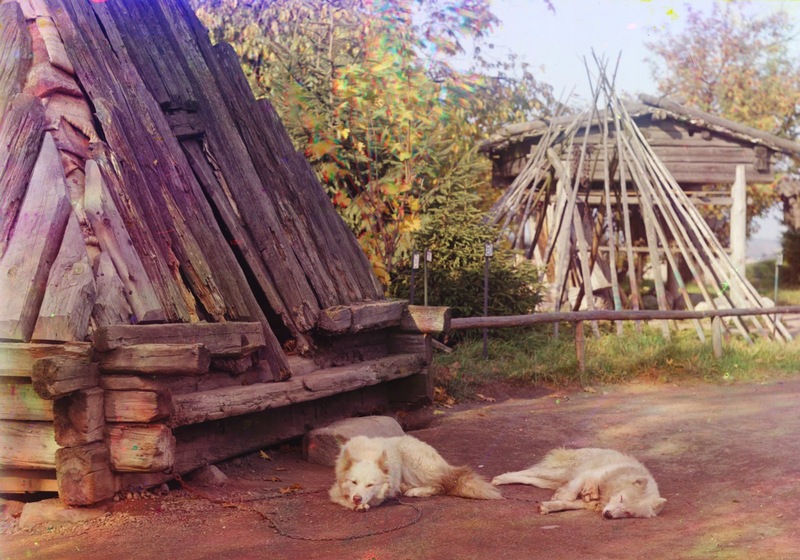 It was back in June 2012 that I first wrote about the amazing work of Russian photographer Sergei Mikhailovich Prokudin-Gorskii in the early 20th century. His collection was subsequently purchased by the United States Library of Congress and is available in the public domain. 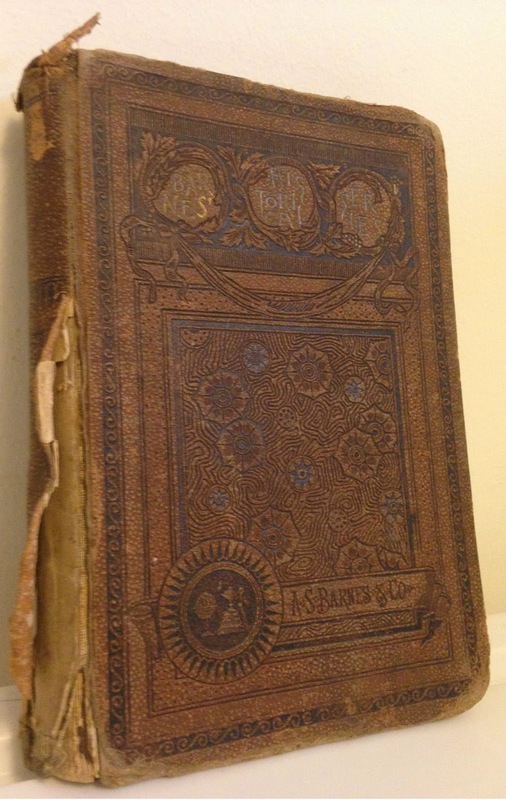 The Library's collection is organized online at "The Empire That Was Russia." 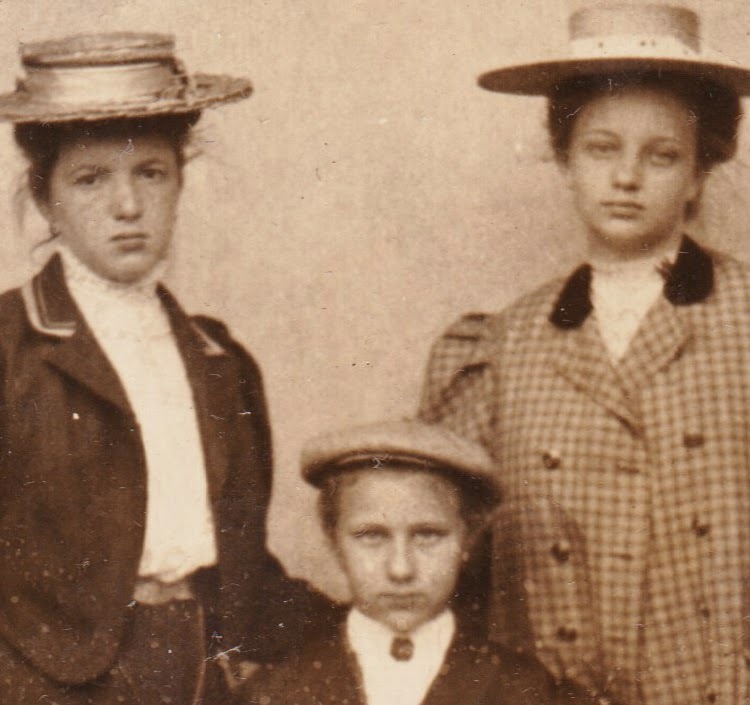 Here are some more wonderful images from those vast archives (most of them cropped). I hope this encourages you to go check them out for yourself. 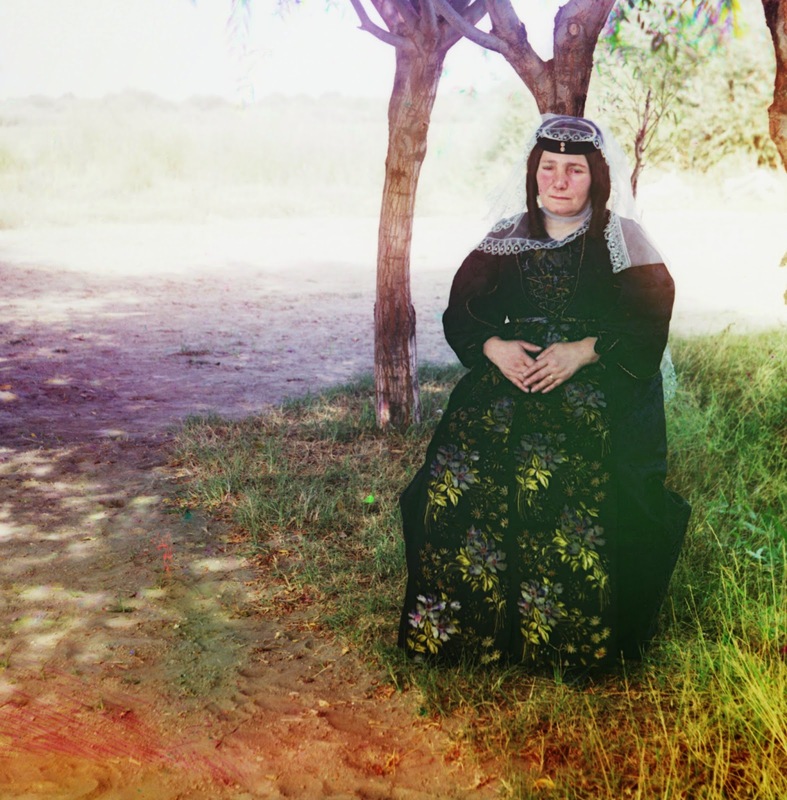 Above: Georgian woman seated in the shade of a tree. Taken sometime between 1905 and 1915. From the album "Views in the Caucasus and Black Sea area, Russian Empire." 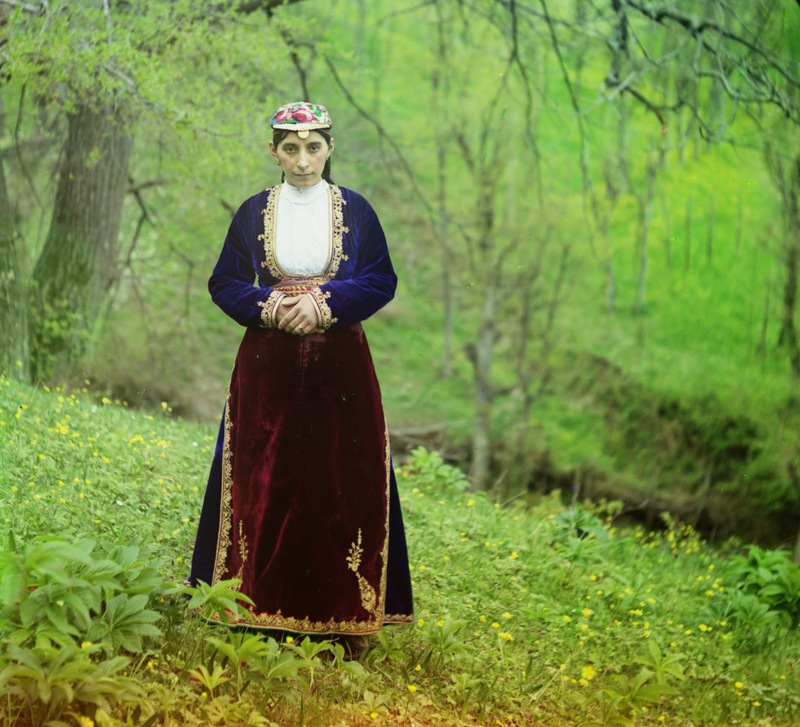 Above: Armenian woman in national costume, Artvin. Taken sometime between 1905 and 1915. From the album "Views in the Caucasus and Black Sea area, Russian Empire." Above: Guard dogs. Taken in 1910. From the album "Views in the Ural Mountains, survey of industrial area, Russian Empire." 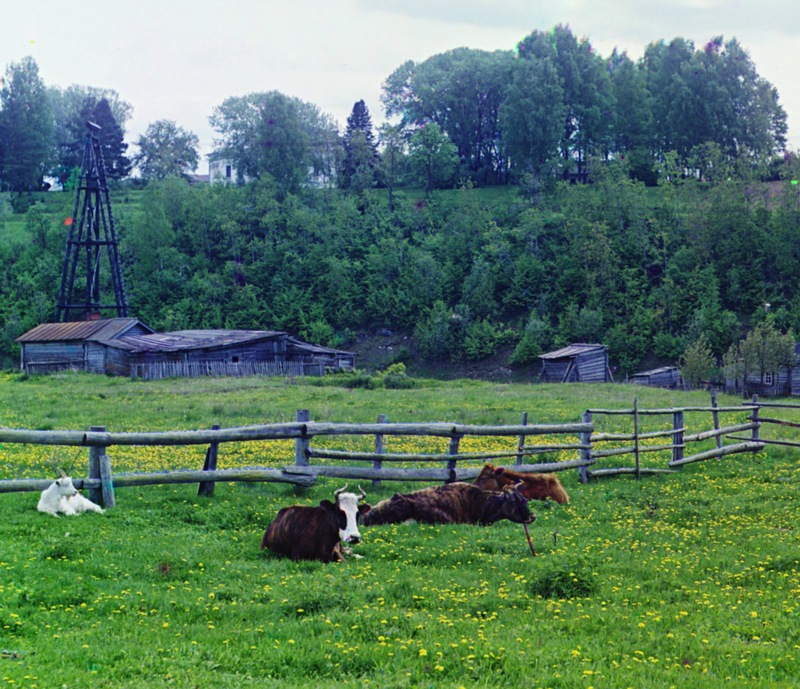 Above: Cows in a field. Taken in 1910. From the album "Views along the upper Volga River, from its source in the Valdai Hills to Kalyazin, Russian Empire." Above: At the Saliuktin mines. On the outskirts of Samarkand. 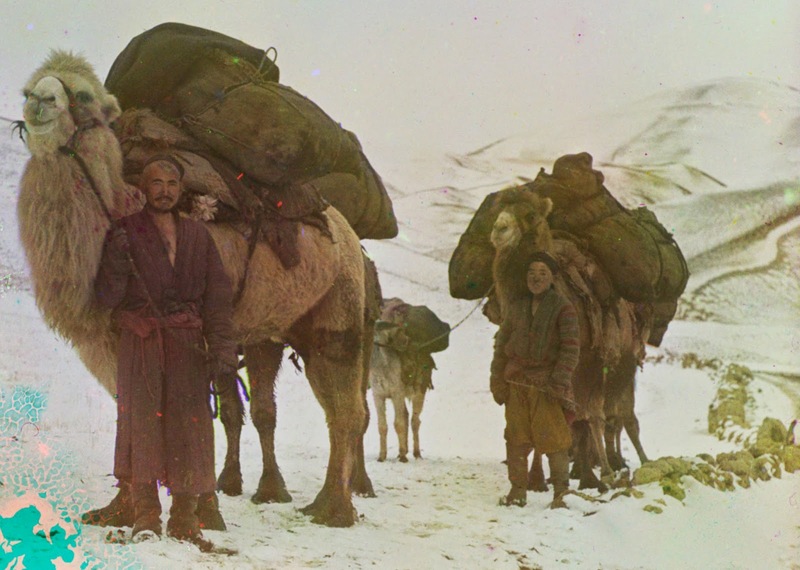 (Men with packtrain of camels in snow-covered mountains.) Taken sometime between 1905 and 1915. From the album "Views in Central Asia, Russian Empire." 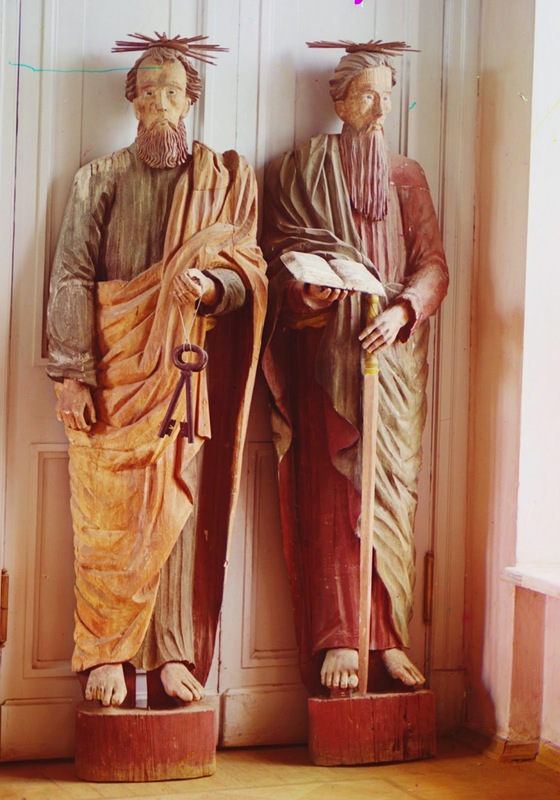 Above: Two carved wooden statues of bearded men with a haloes above their heads, one holds a set of keys, the other a book. (Title devised by Library of Congress staff.) Taken sometime between 1905 and 1915. 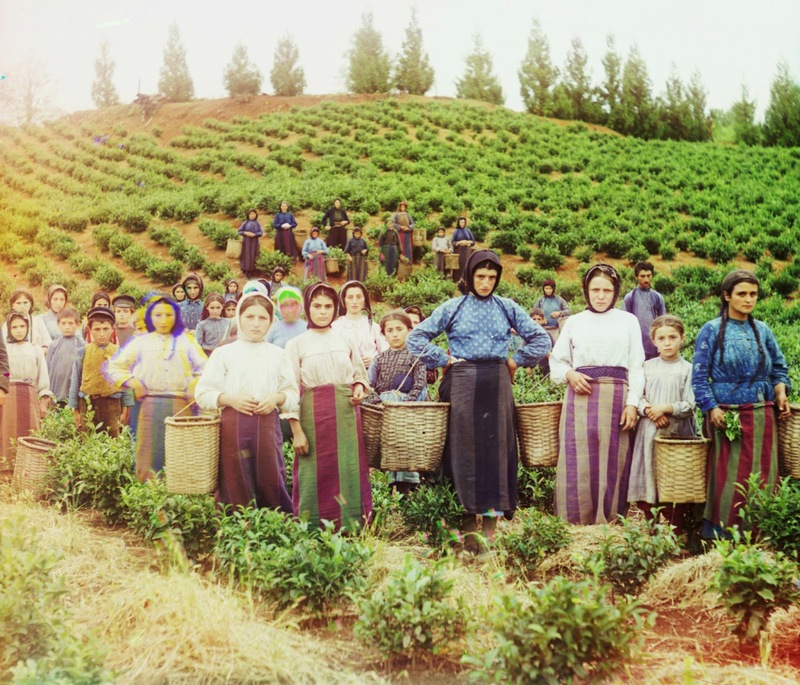 Above: Group of workers harvesting tea. 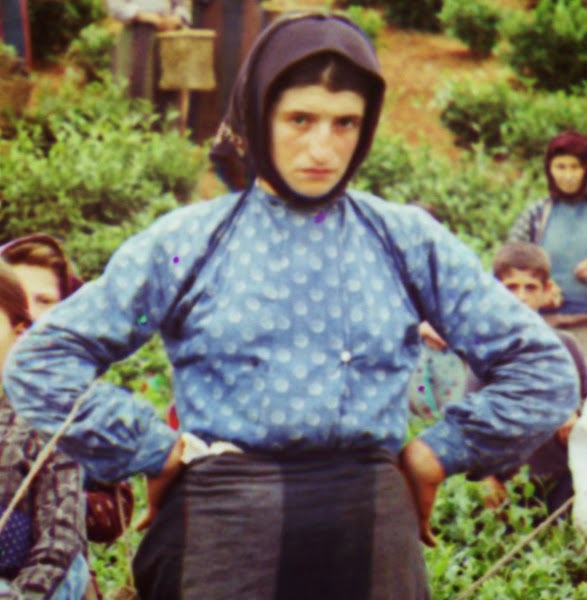 Greek women. Taken sometime between 1905 and 1915. From the album "Views in the Caucasus and Black Sea area, Russian Empire." "Are you finished taking your photograph? Some of us here have work to do." Today's mystery photo is just a smidgen under four inches wide. Within the oval framework is a photo of three girls. 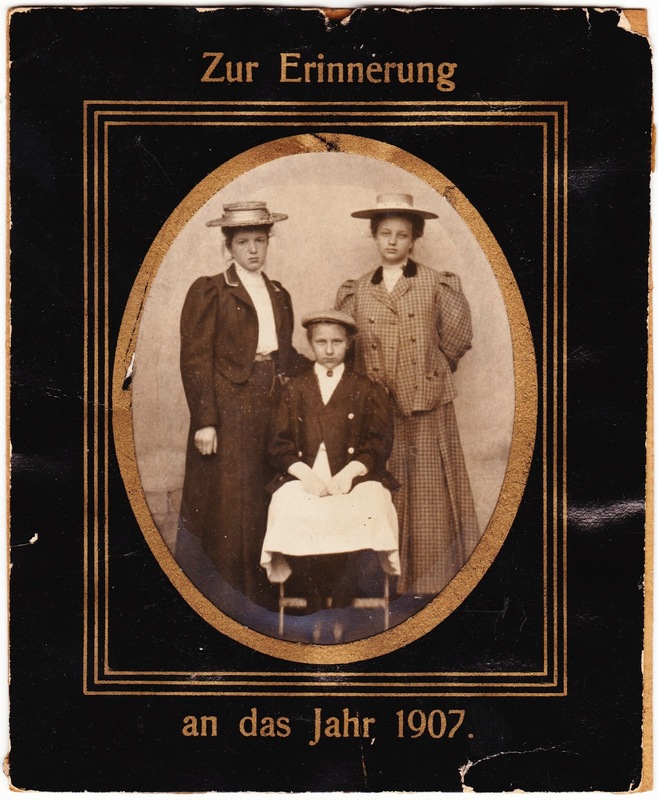 The German text on the frame states: "Zur Erinnerung an das Jahr 1907." Translations of that would be to the memory of the year 1907 or for the remembrance of the year 1907. There is no information on the back of the photo that would help us learn who it is that we're remembering. They do look a little grumpy, though. Perhaps their clothes were uncomfortable. Or they didn't like having their picture taken. Or maybe they just wanted to get back to reading Stefan George's latest volume of poetry, Der siebente Ring. Or perhaps it was all of the above. "Eatin's real fun at the world famous Old South. Best real Pit Bar B Q in the South. Enjoy the rustic, informal atmosphere that's loaded with Southern Hospitality, which leads you to reminisce of days gone by." Alas, the reminiscing of days gone by at Old South are now, themselves, days gone by. According to the fabulous website RoadsideAmerica.com2, the "fondly recalled barbeque tourist attraction" is now "gone." "Boy, this was the place. Every time we would go fishing on Lake Okeechobee we would stop at the Ranch for lunch on our way home. IT WAS THE BEST! ... We used to climb on the fiberglass horses and cows and play on their outside decor forever and the food was great too." "This place had all of that plus an outside ambience beyond description. The roadside signs started 50 miles north of Clewiston on HWY 27. I knew that we were almost home when we started seeing the signs." "The outside was full of fiberglass 'old west' characters, wagon wheels, and punny signs adorning the building and parking lot. 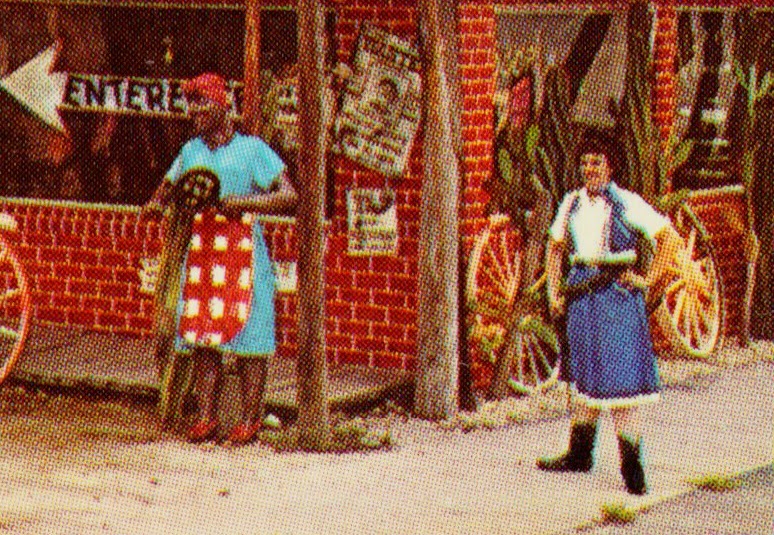 The inside was full of old west decor and bric-a-brac, and the waitresses wore Dale Evans-style cowgirl costumes with toy holsters." 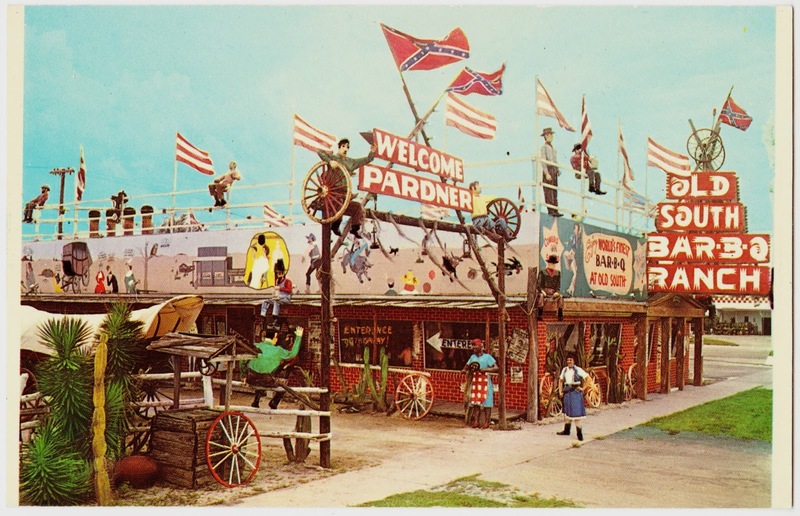 For more memories of Old South Bar-B-Q Ranch, check out RoadsideAmerica. And if you have memories of your own, share them with future generations by leaving them on that website or in the comments section below. 1. Clewiston is known as "America's Sweetest Town" (as opposed to "The Sweetest Place on Earth" in Hershey, Pennsylvania) because of its surrounding sugar plantations. It is the home of professional angler Roland Martin. 2. Not to be confused with Roadside America in Shartlesville, Pennsylvania, which is itself a treasured roadside attraction. A couple of years ago, I came across this amazing book1 and then ferreted it away for safe-keeping after browsing through it for a little while and realizing what a treasure I had come across. Now, when I write "Best. Book. Ever." this is me we're talking about. So I'm not necessarily talking about the words on the page.2 I'm talking about the book's physical appearance, the interior markings and inscriptions it has accumulated over the years and things that have been tucked away inside in previous decades. In that context, this book is an absolute gem. It's going to take multiple posts to work through all the wonderfulness in this 19th century book. But that's OK. We have time, right? To begin, the 362-page book is titled A Brief History of the United States. It was part of the Barnes Historical Series and was published by A.S. Barnes & Company of New York and Chicago. 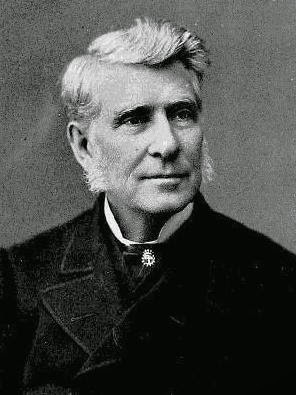 The company founder was Connecticut native Alfred Smith Barnes, who was known as "The General" and was a major benefactor of Cornell University. 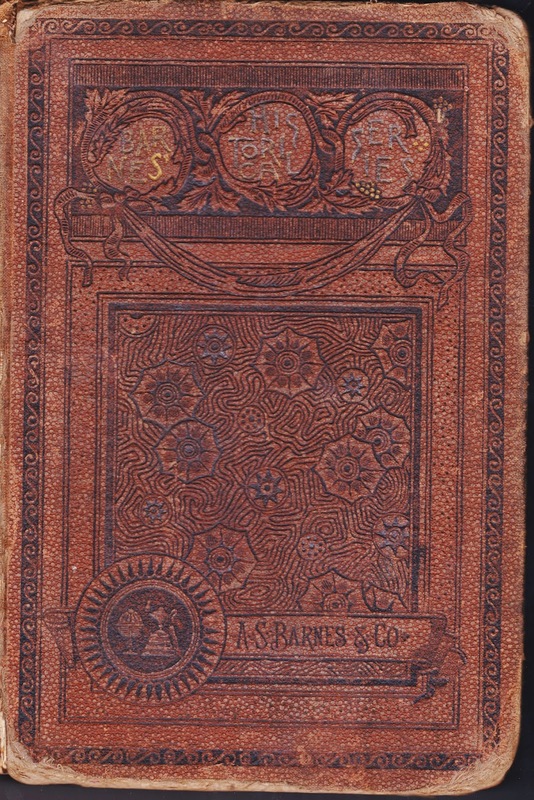 A.S. Barnes focused on publishing textbooks in its early decades, and A Brief History of the United States was one of its most notable titles. It was first published in 1871 and then revised in 1879, 1990 and 1885. The book featured here is the 1885 edition. No authors are listed on the title or copyright pages. But there is an 1885 preface signed with the initials J.D.S., and Joel Dorman Steele (1836-1886) is cited in some places as the author of the A Brief History of the United States. 1. The book was in a box of excess/unwanted inventory that we purchased from a local book dealer. 2. Those are important, too, of course. 3. As another aside, A.S. Barnes & Company was the publisher of The Official Encyclopedia of Baseball in 1951, one of the sport's early comprehensive reference books.